I found this 1971 BMW 2002 when I took a wrong turn into a shipping business in Davis County in 2005. It hasn't moved since but is apparently not for sale. 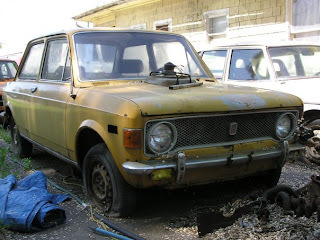 Too bad, it's in fairly decent shape (Andrew will tell you the shock towers are probably trash, which is likely) and I doubt it'd take much to get it running and driving, though restoring it to concours condition would be a chore. Early round taillight models are less common than later 2002s so it's a bit of a shame to see it sitting like that. Old, orange, Italian and rusty. This Fiat 128 was sitting off of Main Street in Salt Lake City. A true testament to the quality of metal Fiat used in the late 70s, every body panel was rusty. The floor pans had deteriorated into nothing. That aside it was fairly complete but it hadn't been run in a long time. If I remember right, the owner was asking $500 for it. I passed on it and the car is now gone, off to the Italian car heaven in the sky.. where they hopefully don't salt the roads. This BMW 2002 is sitting behind a gas station in Salt Lake City. Cosmetically it's okay, it doesn't have any major issues, the body is straight and rust free. It's missing some trim and those hubcaps are less than desirable. I can't speak for the mechanicals other than that everything is there. It is my opinion that most British cars are less than sellar. With that said, it's unlikely I will personally feature very many of them on this blog. This Austin-Healey 3000 is a notable exception. Fresh out of a barn, or so it seems, it was sitting outside a shop in Ogden, Utah. The amount of patina this car has is unbelieveable. It needs serious work but I'm sure it'll be a good driver for somebody with the right amount of work put into it. Despite its troubled past with an identity crisis, the 914 is finally getting the respect it deserves from the vintage sports car community, especially fellow Porsche people. Perhaps it's because hindsight is 20/20 as they say, or perhaps its because a new generation of sports car owners are discovering this mid-engined classic and realizing how drastically overlooked it's been. 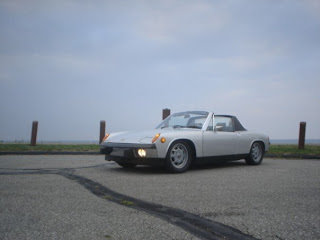 As with most vintage sports cars of this era, the Porsche 914 is a very basic machine in most respects. In many respects, moreso than its contemporaries. There is no wood trim inside, polished aluminum, or excessively pleated leather seats; only basketweave vinyl and black plastic. When you open the light, low, and wide doors with their unique simi-circular handles, you really do sit DOWN in the car. Your legs strech out in front of you to the bottom-hinged pedals and the backs of your legs are only a few inches from the floor, which is only a few inches from the road. Your body sits comfortably in the firm, but very supportive and surprisingly comfortable seats, which are merely some foam, covered in black vinyl over a fiberglass shell. Three large VDO gauges face you purposely from behind the skinny yet distinctive Porsche 4-spoke steering wheel. Porsche purists will recognize that unlike it's predecessors, the ignition is on the right side of the steering collumn. The Volkswagen parts-bin was used heavily in the production of the 914, but that's not to say that this vehicle feels "cheap" by any means. All controlls are well-made and perfectly suited to this machine as a true driver's car that spares extravagances. A twist of the key one stop to the right engages electrics and the fuel pump starts to tick from the front of the car. Three pumps of the throttle primes the Weber 40 IDF carbs and with a moderate turning of the starter, the air-cooled flat-four comes to life. It's loud, smells of oil and gasoline, vibrates, and spits black soot out of the exhaust pipe. This car is a bit brutish. It's not trying to win friends with it's charm, but it will definately show you a good time if you know how to handle it. The 5-speed manual transmission is straight out of the early 911 and maintains the unique doglegged 1st gear shift pattern. The mid-engine placement makes for a somewhat elaborate shift linkage that can certainly be challenging to anyone used to a Honda Civic or a VW Golf. Once it's understood however, the shifts can be made very quickly despite the long throws. The VW Type-4 powerplant is no Porsche flat-6, but its certainly well suited to this very light weight car. It has more than adequate torque, and effortlessly pulls evenly from a stoplight, right up to 5500 RPMs. Passing other cars in 5th gear is a breeze on a two lane road. 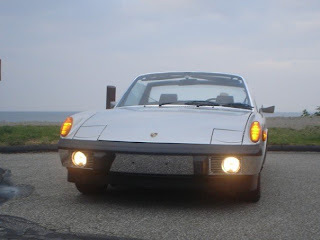 The steering mechanisim and torsion bar front suspension is straight from a 911 and thanks to that, and the 914's near perfect weight ballance, this car handles not too unlike a Lotus Seven. If pushed hard into a turn, there is a tendency to oversteer, but nothing a good driver can't easily catch - or for that matter, be thoroughly ammused by. Back country roads are not the only situation in which this car is perfectly in its element. It cruises wonderfully and smoothly at 80mph on an interstate and has no troubles in stop and go city traffic. With its two trunks and comfortable seating, it's perfect for a weekend trip to the track. When the weather gets cold out, the fiberglass hard top easily clamps on, and the heater from the car's exhaust heat exchangers keeps things very warm inside. This particular example has been an ongoing project car with my father and I for nearly a decade. It's always improving slightly, and never ceases to be great fun. 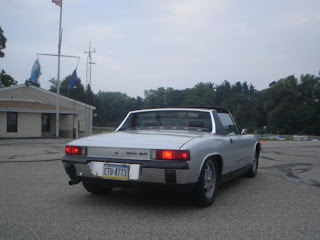 While it may have been badged the "Poor man's Porsche" back in its day, the 914 is in actuallity every bit as worth of attention as its relative the 911 and dare I say, in some respects better. Over the pond and into... a Dallas junkyard. Today, bringing a fairly new car in from Europe or Asia to the United States is virtually impossible. No, it's not impossible; you can bring a Porsche 959 in, but you'd better have pockets as deep as Jerry Seinfeld's. Realistically, a European model of a standard car, like a Mercedes-Benz E220 CDI or a BMW 330d, is not going to be legally imported to the United States for on-road use unless you're a diplomat or are willing to buy several cars for the government to crash and sniff tailpipes. But it wasn't always so. Once upon a time, it was so common to import a specific model from Europe that we had a term for it: Gray Market. Yes, that term still exists today, but we don't use it for newer cars in the United States. A huge industry in the past, importing European models of common cars is now a mere relic of the past. So why did people once want European models? Often, it was because they were cheaper than the ones distributed officially through the dealer network. You could scrimp on luxury options and have the same basic goodness in a less expensive package. Rather than getting leather or MB Tex seats, you'd end up with plaid cloth; electric motors went out the window to be replaced by manual cranks; air conditioning, a "must have" for U.S. consumers wasn't so necessary to Europeans. Lots of little differences. Sometimes it was for performance. Less stringent European emissions standards in the '70s and '80s meant that simpler, more reliable powertrain options were available on the cars U.S. buyers wanted. Instead of suffering through complex fuel injection systems, expensive catalytic converters and seemingly dangerous reactors. And, maybe, some buyers just wanted something a little more exotic. A slightly different badge on the back, less aggressive bumpers, unique color combinations, and the like. Regardless, all Gray Market cars came over for a reason and it seems that most were just used as daily transportation, just like the U.S. cars. No doubt all of the cars pictured - Mercedes W123s found in a Dallas area junkyard - each have their own interesting story. Too bad they'll never be back on the road. Do you have a good Gray Market car story? Please share in the comments section below. A friend of mine has this 1961 Volkswagen Bus sitting in his garage. It's a 21 window model which is quite valuable today. It's seen better days-- it doesn't have an interior, doesn't have an engine, has some body issues and some broken glass but it's a perfect candidate for a restoration. The last registration on the plate of this 1981 Alfa Romeo Spider dates back to 1994. "I don't know much about it.. it ran once", according to the owner. The car was parked because it needed a clutch and it was never started up again. It's sat outside since and it's deteriorated to the point where it's a parts car at best. Interior is trashed, top is trashed and the body is breathtakingly rusty. Drivetrain is intact but it would obviously need some work to run again. The trunk is home to no less than half a dozen bee nests (which by now have most likely died a very cold death.) 1981 is generally considered as a year to avoid for Spiders and this car isn't worth restoring. I considered buying it to put the drivetrain in my GTV but I passed on it. It'll likely end up being sold for scrap metal. Road test: 1979 Mercedes-Benz 300D. The W123 300D has long had a reputation for longevity and operating economy. This particular example, a 1979 300D, displays 194,000 miles on the odometer. It is common to find these cars with an unfaithful or completely dead odometer but this one seems to be fairly accurate. The body shows some rust behind the front wheels, a common place for rust to start; replacement fenders are available (though by no means cheap). Another common place for rust is behind the rear wheels and in the jack points. Plugs for the jack points are available and will go a long way in preventing road salt and other debris from entering the points. The 'thump!' of the door closing gives you an idea of just how solid this car is. The seats in this car are upholstered with MBTex and are quite comfortable but not as smooth as standard leather would be. The trade-off to that is that after nearly 200,000 miles, these seats don't have a single tear in them. European-market cars that have meandered to this side of the Atlantic often have cloth or velour interiors which are sought after if in good condition. The interior in this 1979 has held up very well over the last twenty eight years: the original Becker stereo works, the cruise control works, all the windows and the sunroof work, all the interior lights work, the carpet and the floormats aren't faded, the wood trim isn't faded or cracked but it needs to be reglued in some places, most notably the glovebox door. The dash does have some cracks (a common w123 issue) but they're not bad and the aftermarket dashpad covers them nicely, albeit not very discretely. The backseat is roomy and comfortable to ride in. The gas gauge works at its discretion. Turn the key to 'on' and wait for the orange glowplug light to come off. A moment of silence for Rudolf Diesel, as it's been called. The car can be started as soon as the light comes off. The 1979 still uses the old loop-style glowplugs which take longer to fully warm than the later pencil-style glowplugs. Retrofitting pencil plugs to earlier w123s is easily doable. Once the car has started there is a little knob below the instrument cluster that lets you adjust the idle, an appreciated feature that is absent on later w123s. You adjust it higher for colder weather and gradually lower it as the car warms up. This five-cylinder oil burner transmits power to the rear wheels via a four-speed automatic, the only transmission availble in US-market w123 300Ds. European markets got four and five speed manuals - if you are looking at a manual 300D it is either a conversion (an OM617 engine in a 240D or 240D manual transmission in a 300D) or a gray-market car. As with other Mercedes' of this vintage the gear shifts are rather crisp. The transmission is sensitive to input and you have to learn to feather the pedal through shifts to get it to shift smoothly. The transmissions in these cars can start to wear out after about 200,000 miles and can slip or flare. The relatively easy task of changing the transmission oil and oil filter will significantly prolong the transmission's life. Unless you're coming from a Fiat 850, your first impression of it is that it's not terribly fast. In fact, it's not fast at all. Which brings me to another point: being a 1979, it's normally aspirated, it's not turbocharged like later 300Ds. With the 5-cylinder engine screaming away, the best 0-60 time you can hope to achieve is around 17 seconds. That's on par with a Super Beetle. When you do get it up to speed it's very stable. It rides smooth like any Mercedes should and the steering, commanded through an almost comically large wheel, is precise. It has adequate power to pass but it's not the freeway cruiser that the 300E was, which is to be expected. Mercedes doesn't build cars the same way they used to in this era, anybody who owns a w123 will tell you that. They are solid, reliable, relatively easy to mend and safe even without the latest safety gizmos. With the growing enthusiast base these cars have gathered they are quickly entering classic car territory, making the w123 300D the best of both worlds if you can put up with the lackluster acceleration. If you are in the market for a w123 odds are you will find either a 300D or a 240D (both in US-market trim), odds are its odometer will read a number not too far off from the distance from the Earth to the moon and odds are it will have several little issues that need attention; these are your run of the mill w123s. Pay extra if you find a gray-market car (especially one with coveted five-speed stick) or if you find a w123 with low mileage (e.g. sub-150,000) on an odometer that is known to be original and working. Consider service records a huge plus. For more Mercedes content click on the "Mercedes" tab on the right of this page or click this link. And, have a look at our Facebook page to find photos that aren't on this site or discuss some of the cars we feature in these pages.